The Old South Cemetery was used from 1756 till 1939. It sits between the South Green and the Ipswich River and is an easy walk from downtown. A walking trail extends down the slope to the River and continues downstream to Sally’s Pond near the Whipple House. It has approximately 1000 interments, and is a beautiful area to visit, but many stones are in a state of disrepair and severely eroded. 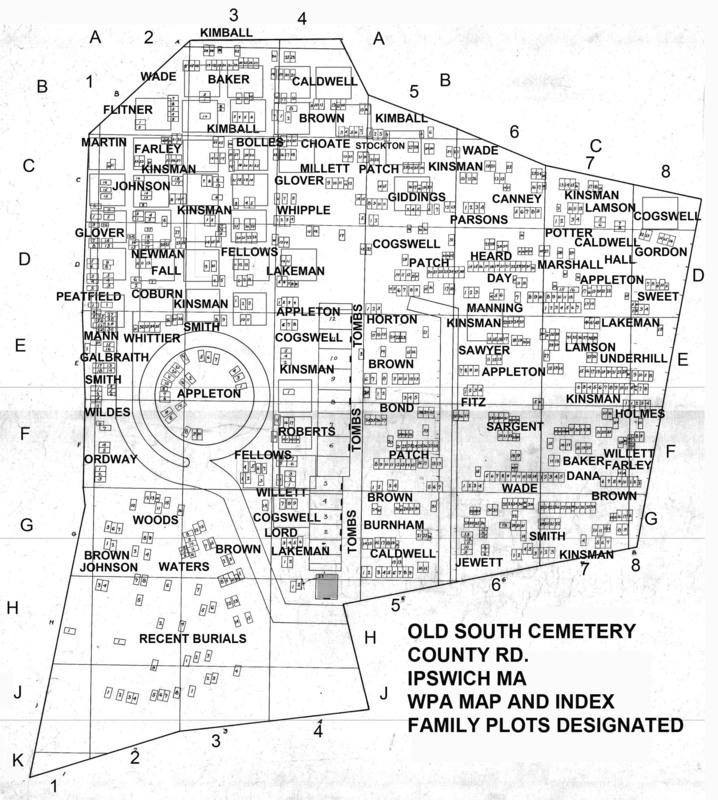 The Works Progress Administration (WPA) surveyed this cemetery and the Old North Burying ground in 1935, and created comprehensive records. View gravestones at the Old South Burying Ground on the Findagrave site. This cemetery is medium-sized for a country ground, about 1000 interments. It measures at least 200’ wide and wider in some points, and extends 400’ to 500’ from the far edge of the old Ipswich “green” (where commoners who abutted the “green” were allowed to let their livestock graze) to the bank overlooking the Ipswich River. Of all the cemeteries in Ipswich, this is the one in most disrepair, and also the one with the most potential to be a beautiful and restful spot, because it overlooks an idyllic bend in the River, and has trees and bushes of every variety. The stones are quite old and beautiful, but many have been severely eroded, and there are also many tombs along one of the main avenues and many family plots. The front of the ground is bordered by an old iron fence. The cemetery was first used in 1756. Regular burials here started about 1784. It was used until about 1939, with only two burials after that, with some recent additions. All told, there are about 900 records. Location of cemetery: The grounds are on County Street aka Route 1A and also Route 133, as they follow the same path through Ipswich. From the main intersection in the villAGE of Ipswich, sometimes referred to as “Five Corners” (the intersection of Market Street and Central Street and South Street converge here), proceed east on Route 1A for ¼ mile, and you are there. The ground is located on the western edge of the village green on Route 1A, an easy walk from downtown, past some beautiful antique homes and buildings. This cemetery is also a stone’s throw from the Whipple House, an extraordinary example of early architecture, and the Hurd House which is the home of the Ipswich Historical Society. The following names, descriptions and photos are from the FindaGrave site. Special thanks to Diane and Kate for sharing their photos. The map locations are from the 1935 WPA grid map. The last number refers to the number in the specific grid. For example, Caroline Adams below is grave # 4 in grid Grid 5D. Sizable family plots are noted.